Before I blather on about how amazing Wales is I’d like to point out two important things. 1. On the subject of the Russian provoked LJ to Dreamwidth exodus: – I’m there as Stegzy too (http://stegzy.dreamwidth.org) although I rarely post there because I forget to do so but feel free to add if you are there. Alternatively, you can follow me on Blogspot (http://stegzy.blogspot.com or ) although, to be fair, you’ll only get to see articles and social media posts that I like there. 2. Did you know that Smart Cars come with a free invisibility cloak? Similarly, Mercedes cars come with automatic road ownership deeds it seems. Wales – that crinkly bit that keeps the West Midlands away from the sea. The bumpy bit that keeps Cheshire cheesy and the coaly bit that kept Cardiff busy for a couple of hundred years. That’s where I’ve been. 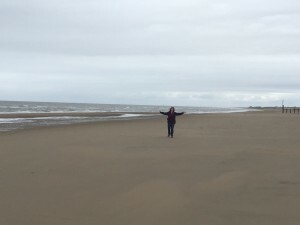 If you’ve read this journal long term, you’ll already be familiar with my love affair with the place but usually, I either float between the Llyn Peninsula, Anglesey or South Wales. This trip, however, we loitered with intent at the foot of Snowdon, in the glorious Conway valley while using the peaceful former fishing village that’s soon to be the front garden of a nuclear powerstation, Cemaes Bay as a base to launch a sortie into Llandudno before scooting up the coast via Rhyl towards Liverpool. Our journey began early Good Friday morning when, fortified with chocolate porridge, I drove (invisibly) north via the sat-nav’s “Shortest route” which eventually seemed to want to take us through the heart of Coventry. “Stuff that!”, I thought and quickly joined the M6 at Walsgrave and navigating by memory westward along the M54 bypassing Telford and Shrewsbury. First stop was at the mysterious often cloud bound lake of Llyn Brenig. 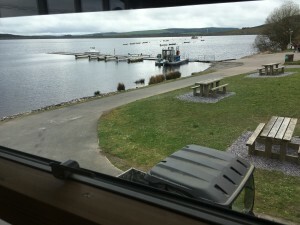 I first visited Llyn Brenig over thirty years ago with my Aunt Joyce. I remember the visit fondly especially as it was in the visitors centre there that she bought me a memorable puzzle book which featured a maze through a haunted house. More recently, Mrs Gnomepants V1.0 and I made a return visit to Llyn Brenig around 1999 where I was pleased to see that the visitors centre hadn’t changed, the shop still sold cool books and there was an informative exhibition detailing pre-Cambrian times, dinosaurs and ice ages and how they were important in supplying water to modern day homes in Wales. As with all things, the sands of time have been harsh to Llyn Brenig. While the scenery hasn’t changed much, it seems that the visitors centre has. The exhibition, once so informative, is now reduced to a rotary leaflet cage and a couple of dodgy looking poster boards in an entrance hall; the vast majority of the floor space now given over to a new bright and airy cafe selling a range of trendy coffees and cakes. Mrs Gnomepants V2.0 seemed to enjoy it though, especially after a brisk wind lashed walk along the lakeside together. Back to the car, we drove further north towards Bodnant Garden. 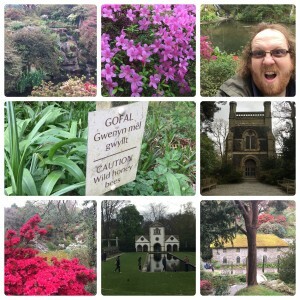 Bodnant too has changed since my last visit nearly 15 years previous. The once dominant faux-Swiss log cabin cafe with the gorgeous cakes has now been replaced with a flimsy looking wooden shed like structure, sadly now lacking the gorgeous cakes. One bonus change about Bodnant is that visitors no longer have to take risks with their own lives by attempting to cross the road from the carpark to the actual gardens. Now you can cross in safety by taking the tunnel under the road while trying to visualise where the dominant faux-Swiss log cabin has gone and whether those fifteen year old cakes were actually just a dream (surely no-one could really make profiteroles the size of cricket balls). Another change about Bodnant is the footprint of the gardens. Since my last visit, new areas have opened up and there are some really interesting juxtapositions of man-made and natural landscapes enhanced by the lovely rhododendrons and other flora. After a quick lunch and an even briefer lesson in Welsh at the disappointing cake sporting shed, we jumped back in the car again and yet again drove (invisibly) north then west along the A55 to the delightful Cemaes Bay. We last stayed in Cemaes in 2011 but it seems I was starting a new job around that time so long pieces of prose took a back seat. It hasn’t changed much. Some of the quaint little village high street shops have shut but everything else seemed almost the same. The hotel, mostly unchanged. The high street, mostly unchanged. The strange elderly man with his unusual tick, mostly unchanged. The quaint quay (or was it a jetty), mostly unchanged. The little kitten following us down the lane, mostly a different kitten. The peace and tranquility juxtaposed against the crying seagulls, lapping waves and irritating yapping from a distant dog. Lovely. Equally lovely and unchanged (mostly) is Llandudno where we visited the following morn. A killer wind prevented (yet again) a cable car trip down the Great Orme. It has been thirty five years since I last travelled down the Great Orme by cable car. This time Mrs Gnomepants V2.0 and I caught the cute Victorian cable tram down the hill into the town. 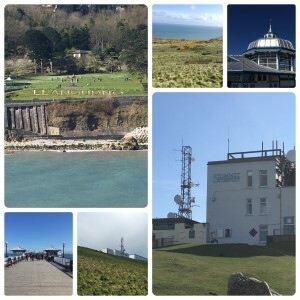 Llandudno – Where the old go to die (and have a holiday). Llandudno is where old Scousers go to die, much like how Worthing is where Brighton pensioners go and Scarborough is where old biddies from Leeds, Wakefield and Sheffield go. A massive Victorian seaside retirement town complete with remains of ornate gardens, grand hotel and a pier selling ice cream to wailing and demanding grandchildren. You can see how Llandudno was once a grand place where the wealthy would adjourn to during the summer months following a busy year promenading around the city. Big former hotels, big wide sweeping boulevards and avenues, now largely an amount of old buildings just waiting to accidentally on purpose catch fire, be pulled down and turned into luxury flats. From Llandudno we nipped back over the Conwy estuary to Conwy. A delightful town within a castle’s walls. I always think of Conway as being much bigger than it actually is. It isn’t big at all though. Consisting of about five short narrow main streets and the UK’s smallest house. The town is enhanced only by the constant throng of gawping tourists mooching around the place making everything expensive. 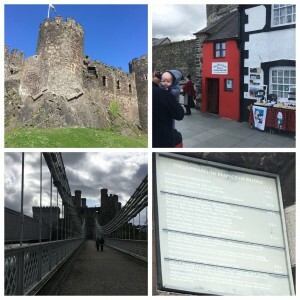 On this visit I managed to locate the UK’s smallest house and, as a bonus trick, was also able to visit Thomas Telford’s bridge and tollhouse. Such an amazing feat of engineering. I often feel that Telford is overlooked because of Brunel yet all Brunel did was make a railway that nobody could use and build three massive ships that bankrupted him. At least the majority of Telford’s legacies are still used, and he has a town named after him. Meanwhile most of Brunel’s creations are now reincarnated as tins of beans and a bit of Bristol. 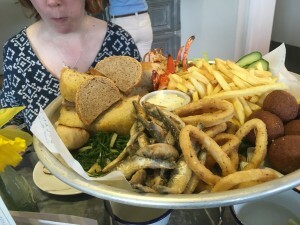 We headed back to Anglesey and dined on mountain of fried seafood before sloping back to the hotel. The mountain of fried seafood was well worth every penny but it saddens me that mountains of fish are not as freely available in the UK as they are in other parts of the world. I sometimes wish I could go on a Mountains of Fried Seafood tour of the world. Perhaps when I’m a millionaire. Or retired. Or fed up of the sight of Fried Seafood. The next morning I fulfilled my threat of taking Mrs Gnomepants V2.0 to Rhyl. If you’ve never been to Rhyl, you’re lucky. Rhyl was once a place where elderly Scousers went to die. Now it is where elderly scousers who live most of the year in static caravans go to die. Indeed, as if to illustrate Rhyl’s level, we espied a family happily having their midmorning cigarettes on the veranda of their static with a view of the main road while dressed in their nightwear. Awesome. I didn’t leave her there honest!